Posted on Mon, Mar 12, 2012 : 10:10 a.m. The University of Michigan is partnering with Dow Chemical Company to create a sustainability fellowship that will foster nearly 300 scholars in six years. Dow Chemical CEO Andrew Liveris and U-M President Mary Sue Coleman will announce details of the collaboration at a Detroit Economic Club luncheon today. Their announcement will be live broadcast at 12:40 p.m.. 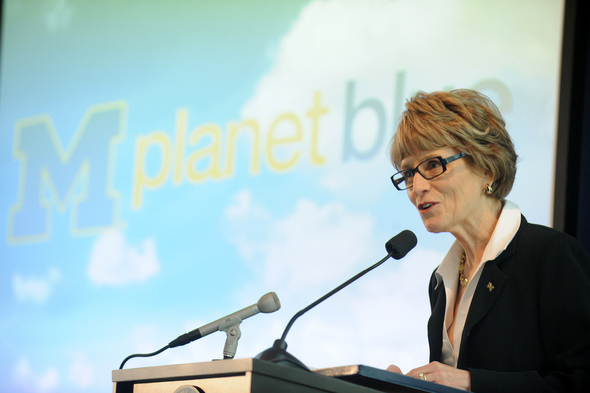 The program is expected to find ways to “help solve the world’s most pressing sustainability challenges, while driving innovation in Michigan and around the globe,” according to a university announcement. The partnership follows a $14 million sustainability initiative Coleman announced in September. That money will go toward reducing runoff on campus, making buildings more energy efficient and purchasing hybrid vehicles, among other initiatives. Mon, Mar 12, 2012 : 4:50 p.m.
Dow Chemical is in the news because the Chinese government had directed one of their Chinese born employees to steal trade secrets. This was one of the first really well documented spy cases where they were able to tie it directly to Chinese Communist Party officials. President Coleman on the other hand refuses to meet with the FBI to talk about espionage concerns and tells the FBI office that their agents are not welcome on campus. It seems like an odd pairing. Mon, Mar 12, 2012 : 3:31 p.m.
Is Dow one of the corporations with Mary Sue Coleman on the board or one of the corporations which has her on a consulting retainer? Mon, Mar 12, 2012 : 4:52 p.m.
Mary Sue Coleman is on the Board of Johnson and Johnson and a textbook publisher from Iowa. I have not seen any documentation of any paid consulting positions but it is possible.